It seems like yesterday, but our last copy run was held in April of this year at the East Baton Rouge Parish Library in Baton Rouge, LA. Thanks to Melissa Easton, Archivist/Librarian, the run was a huge success. We had such a large turnout bring in over 2,000 photos. With only four regular OPR volunteers we were shorthanded. If it hadn’t been for Melissa and her staff helping, we could not have pulled this off. Normally we would not even consider having another copy run until our backlog was down. However, we made an exception and that was to have one last copy run this year: Houston, TX on December 9-10. We were approached by David Bush, Executive Director, Preservation Houston, who wanted to know if we would coordinator with other nonprofits to help save family photos from the recent flood. Because of our backlog and lack of funds, Houston Preservation is sponsoring our copy run. This time around both the photographers and greeters will all be local volunteers from Houston. Unlike previous copy runs, this copy run will be by appointment only. Here is the link to Preservation Houston to sign up. If you know of anyone that got hit by the flooding, pass the information along. 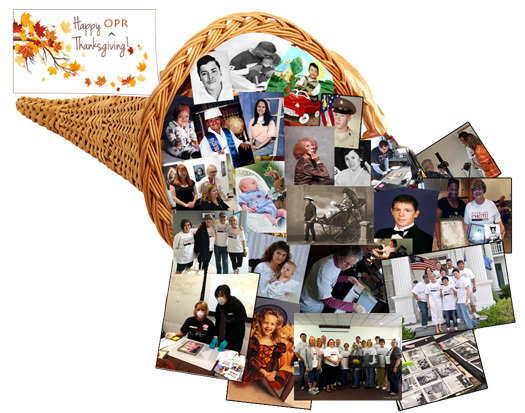 I would like to end by wishing everyone a Happy Thanksgiving and by thanking all our volunteers, our sponsors: PhotoShelter and DigMyPics, and everyone else who has stood behind Operation Photo Rescue. Without you, we would never have lasted coming on 12 years.